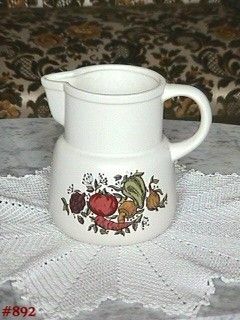 This listing has another lovely item from McCoy's Spice Delight dinnerware line! This one is a pitcher measuring 6" tall. It has the more rounded pouring spout (like coffee pots have). Pitcher is marked on bottom: 132, McCoy, Lancaster Colony (mark), USA. It's in excellent condition -- no chips, no cracks, no crazing -- looks new and unused!